This annual wild flower, a close relative of the knapweeds, grows up to 0.8m in height with tough, greyish-green loosely branching stems and lanceolate leaves up to 4cm long. What makes the Cornflower such a memorable sight is the intense blue of its flowers, which like other members of the Daisy family comprise a cluster of central disc florets (these are more of a violet blue) surrounded by an unusually small number (typically 12) of ray florets. The ray florets are pure blue and widely spaced, with a trumpet-like appearance. 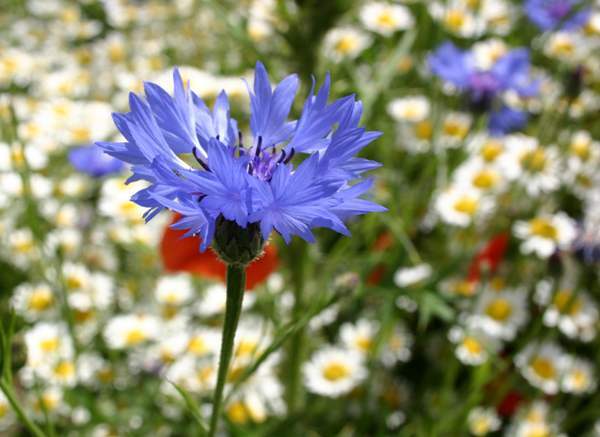 Cornflowers were once very common on wasteland and on arable farmland in Britain and Ireland. The use of agricultural herbicides has virtually eradicated this beautiful wildflower from the British landscape, and it is now only seen if seed has been deliberately spread. In some parts of southern Europe where intensive farming regimes have not yet been adopted it is still common to see cornfields flushed with bright blue and scarlet due to the presence of Cornflowers and Common Poppies. These wildflowers may be no good for cattle fodder, but they are excellent food for the human spirit! 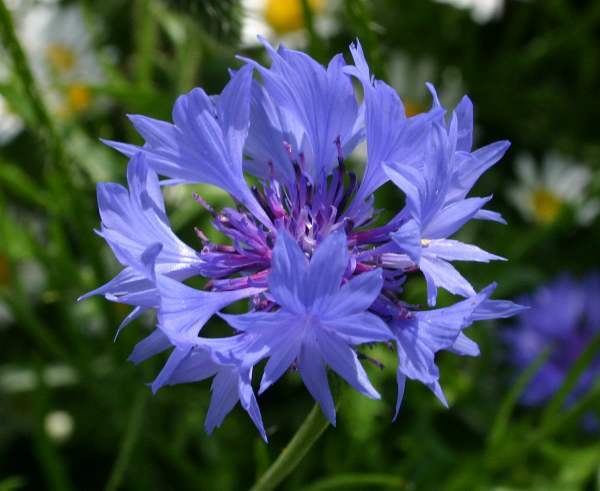 Centaurea cyanus is also found in many parts of North America, where it is a naturalised introduced species and, as in Europe, a very popular choice for growing from seed in parks and gardens. 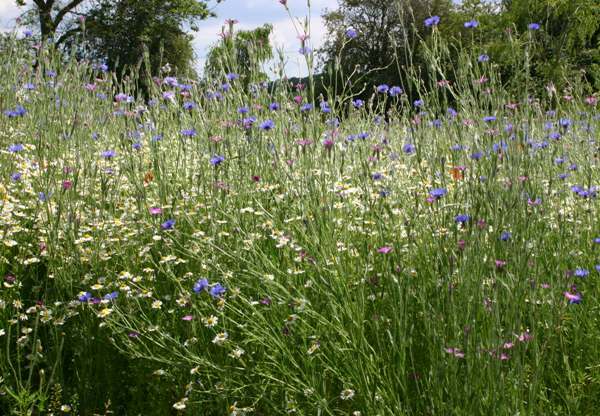 Cornflowers bloom from late June until the first frosts of autumn, and in southern Britain, where the last few truly self-sustaining populations are, they are usually at their best in July. A close relative, Centaurea montana, is a creeping perennial that is often grown in parks and gardens. Centaurea, the genus name, comes from the Centaur Chiron, who used the flowers of this plant as a poultice to cover a festering wound made by an arrow dipped in Hydra's blood, The wound was cured and so, the story goes, Cornflowers were given the name Centaurea. The specific epithet cyanus refers to the bright blue of the flowers, of course.